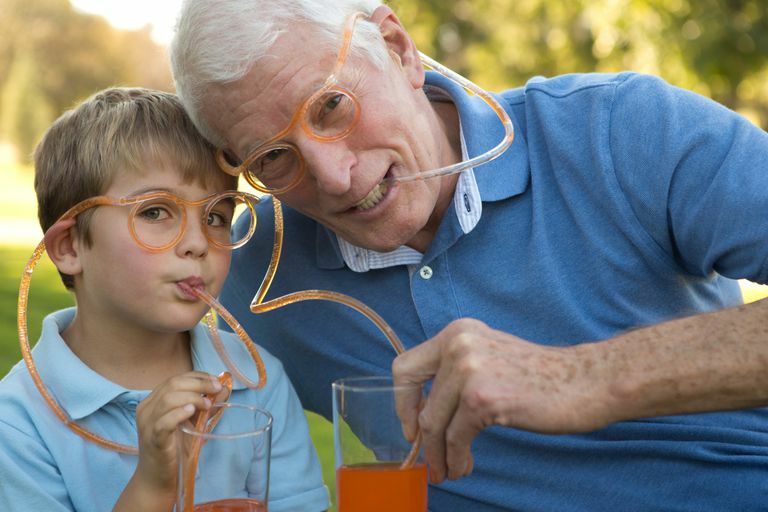 Most school age grandchildren think their grandparents are a little bit bonkers. If yours aren't yet convinced, make certain of it with these 50 off-the-wall, out-of-the-box activities. Share some silly fun, and they'll never see you as normal again. Take a flashlight into a dark closet in the daytime and practice making shadow puppets. Teach your grandchild a tongue twister. Try to catch coins off your elbow. Have a competition. Buy a magnifying glass for you and one for your grandchild and look at everything with them. Bounce a ball back and forth, with the number of bounces increasing each time. See how many bounces you can get before the bounces get so low that the ball can't be caught. Wear pajamas all day. Then put on clothes for bed. Make up a silly song to be sung to the tune of a song that everyone knows. Play in the rain or play in the water hose with clothes on. This one's more fun in hot weather, of course, and never let children go outside if lightning seems likely. Acronym the names of family members, and call them by their acronyms. Wrap each other up with painter's tape. Take pictures. Make an I-Spy board by gluing all sorts of objects to a poster board. Then take turns calling out items for the other person to find and touch. Flip over all the pieces of a puzzle and try to put it together without looking at the picture. Start with a small puzzle. Find a hill to roll down. Blow up one more balloon than you have people and try to keep them all off the ground. Dye eggs even if it's not Easter. Draw a bath for your grandchild and put in lots of toys that aren't bath toys, anything that won't be hurt by the water. Teach your grandchild yoga poses like the lotus and the tree. Then make up your own pose and give it a name. Find some water and throw rocks into it. 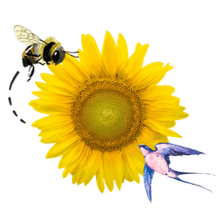 Mark off a section of your yard or garden and count the living creatures you can find in it. Have a pet show with stuffed animals and give one first prize. Go for a walk or hike at night. Be sure to take flashlights. Time your grandchild doing something, like climbing a play structure or running around the house, and record his or her personal best for next time. Have a tea party and make up funny names for the tea and treats. Give each other silly names for a day, and see who does the best job of sticking to the silly names. Find an old deck of playing cards and cut slits in the sides, then use them to build crazy structures. Have a backwards day. Put your clothing on backyards and see how many things you can do in reverse. Find some worn or stained items of clothing and cut them up to create some funky new items. Pound nails into a board. Make a paper doll chain. Have a picnic on a blanket in the back yard. Have a Happy Unbirthday party with odds and ends of leftover party goods. Do make the cupcakes fresh, though. Have a scavenger hunt that's limited to your own house. Give your grandchild a list of small items to find and a bucket or basket to carry them in. Make it more challenging by adding a time limit. If you have more than one grandchild on hand, turn it into a race. Blindfold a grandchild and see how many smells he or she can identify. Use whatever fruits you have in the house plus coffee, tea, cinnamon, pepper, vanilla, toothpaste and anything else with a distinctive smell that's safe to sniff. Have lunch on fancy dishes. Teach your grandchild some riddles. Start with these about food and animals. Let a grandchild style your hair. Speak only in rhymes for a specified time. Teach your grandchild fancy words for colors, such as chartreuse, saffron and fuchsia. Talk like a pirate, or with a British accent. Tape two or more crayons together and draw a picture. Challenge your grandchild to talk for one minute without stopping and without repeating the same thing over and over. It's harder than it sounds. Try it yourself.